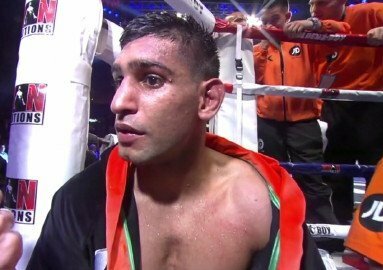 Frankie Gavin: “Khan needs to stop chasing a Mayweather fight"
Gavin, Britain’s only ever amateur world champion, was responding to media reports that Khan is a leading contender to become the next opponent for Mayweather, who made light work of his supposed number one threat, Canelo Alverez, last Saturday which was shown live on BoxNation in the UK. Gavin’s fight with David Barnes, in which he hopes to capture the Lonsdale belt for keeps, is seen in many quarters as Gavin’s last outing at domestic level as he continues his march towards a World title. The fight is a co-feature on Queensberry Promotions’ multi-title curtain raiser for the Olympic Park’s Copper Box Arena. The event headlined, by the huge British and Commonwealth title showdown between Billy Joe Saunders and John Ryder will mark the first of six confirmed shows that Frank Warren and Queensberry Promotions have set up for the next year. Also on the bill Dereck Chisora has a second stab at European glory, after being robbed of the title against Robert Helanius two years ago. Chisora faces Edmund Gerber this time for the vacant EBU title. Paul Butler will be looking to continue to send shockwaves through the Super Flyweight division when he takes on Miguel Gonzalez for the Vacant WBO Intercontinental title, whilst someone will lose their unbeaten record when Liam Walsh faces Joe Murray for the IBF International and Commonwealth Super Featherweight Championships. The exciting Mitchell Smith looks to capture the Vacant Southern Area title against Scott Moises, whilst the hugely popular Frank Buglioni will bring his army of fans to the venue for the first time as he looks to go 10-0. Welterweight Bradley Skeete gets a chance to impress whilst top amateurs Georgie Kean and Josh Leather will make their professional bows on the bill. Previous boxing news: Left-Hook Lounge: Mayweather’s Greatness, C.J. Ross, & Danny Garcia’s Future!! !